Maybe this is the most special and adorable pattern I’ve ever made. I proudly present to you a mother and her pup, Sno & Snoosle the crochet sea otters pattern. Look at them together! They almost look as heartwarming together as real sea otters. Some animals melt my heart when I look at them. I have to admit, I’m easily melted by animal beauty. Seeing mice, blackbirds or foxes doesn’t really matter, to me they all are gorgeous. But when I was looking online at pictures of sea otters, I even got a bit emotional by some of them. The love a sea otter has for its pup is so overwhelming. The way she holds her baby, tends and dries it and the way the baby sleeps on top of her, feeling completely safe, it’s absolutely heartwarming and shows the intelligence and consciousness of them. Of course the utter cuteness of the sea otter and especially the pup helps. Baby sea otters look like living plushies. Their thick and warm coat makes them look incredibly cute and that was a huge challenge for me in the design process. How could I ever match the cuteness of a real baby sea otter? Well, I did the best I could, my first prototype pup looked more like a sloth than a sea otter, but at least I knew how not to make it. Actually, I started with the head of the adult. Most adult sea otters have a white face that looks flat, but if you take a better look, you notice they do have quite a snouty face. So, I had to find a way to make the face look flat, but with a muzzle. After several attempts I found the solution. The body of course was not easy to design either, because I wanted the otter to look upwards a bit. That meant I had to make a curved neck. Also, I wasn’t sure about how to attach the legs and tail to the body to make it look natural. When I got stuck on the adult, I started on the pup, a teeny tiny thing it is! In order to achieve making a tiny little otter, I decided to crochet the body as one piece, so you connect the tail and legs and from that point you work your way upwards. That of course was also the solution to create a realistic looking body for the adult otter. How splendid that worked out. Because I like this text to be as short as possible, I’m not going to tell more about the process. But I do want to add that I am ever so delighted with the result. I absolutely love my sea otter amigurumis. Here are some more pictures and below them you can find info about and links to buy the pattern. And yes, the baby is part of this crochet sea otter pattern! Sno and Snoosle are made with Istex Lett Lopi, a 100% wool with a lot of fuzziness. If you use the recommended yarn, your adult otter will be 8 inch / 20 cm and the baby 5.5 inch / 12 cm long. 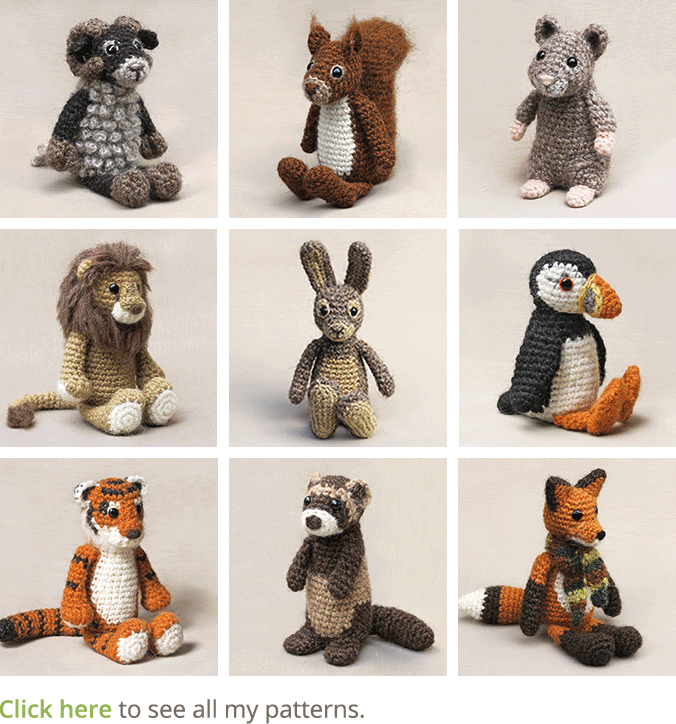 The pattern is written in US terms and contains a clear and colour-coded description of how to crochet and assemble the animals, with extra illustrations and example pictures at the bottom to help you get everything right. In the pattern you can also find what materials you need, the yarn colour numbers, in short, everything you need to know to make your own adorable sea otter duo. All the additional information you need to know about this pattern you can find in the shop listings. You can buy this pattern in my shop at Ravelry, Etsy or order it here. 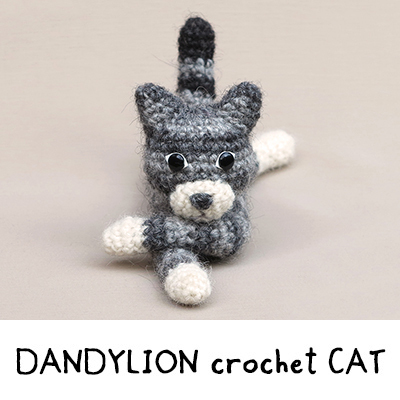 This pattern has a one dollar release discount till Friday the 22nd of Februari. 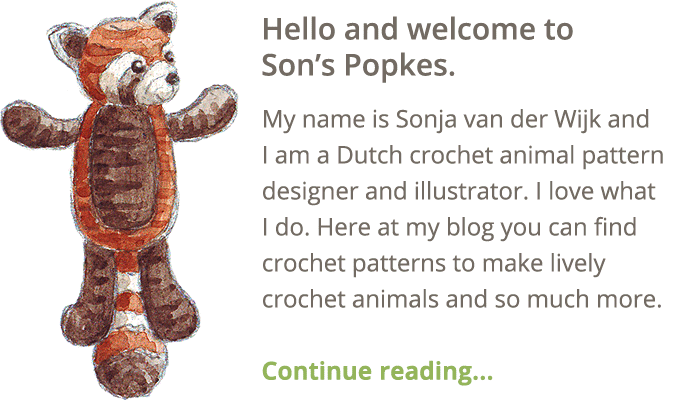 It’s my pleasure to present a new crochet animal pattern to you! This time I made a rather nibbly little creature. I proudly present to you Floki the beaver amigurumi. A crochet beaver pattern has been on my list of animals for a long time, and now I have finally made one. I’m so glad I did. This beaver turned out to be a little doll but he is also very realistic. Before I start making a crochet animal, I think about how I picture the animal, and with beavers it’s their relaxed way of living that is striking to me. They are kind of plump creatures and whatever they do, they do it with total ease. I really like watching them. So, for this beaver amigurumi I had in mind to create a ‘relaxed’-looking doll, nicely shaped with big webbed feet. For the body I wanted to try a different method of shaping, by crocheting the leg- and hip-shapes directly into the body with some extra increases. It worked out quite well, but after the body was stuffed, the shapes became a bit less noticeable. I decided a bit of extra shaping was needed after the body was stuffed, so I sewed a few stitches through the completed body to recover the intended dent. That worked out perfectly and resulted in chubby little hips, and a small tummy even emerged above the hips, how lovely! The dent that formed at the back could easily be covered underneath the big tail, which creates the bottom of the back before the actual tail starts. The idea of how to make the feet looked webbed came pretty easily after the cute little toes I made for the realistic hedgehog. I had in mind to give the beaver the same little toes (nails), this time in a contrasting colour. Now if I embroidered four lines halfway over each foot, starting in the nails, I could create the impression of webbed feet. Luckily for me, my plan worked. The arms I kept small and basic, as beavers have such cute little front paws. Now I’m being all positive about the process, but I had some difficulties. My hedgehog pattern had become so amazing that it felt like I had to make something just as perfect. And with every piece I made for this beaver, I was thinking ‘is this good enough?’ It was silly, really. I had to let that feeling go, because it is nonsense to think that hedgy is the best thing I ever made and now everything has to be just as perfect. I’m totally being honest here: I actually thought of abandoning the beaver. Fortunately, I’m not the kind of person to give up on something, and I had my mind set on finishing this beaver, so after a while that feeling disappeared and I started to really love the little creature I was making. I had so much fun I even made him a little stick. Here are some more pictures of little Floki, and below them you can find all the info you need to get the pattern. 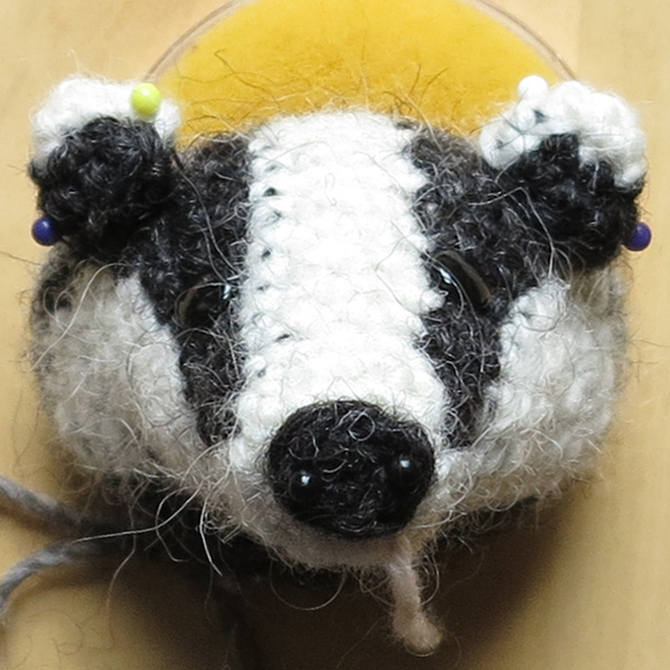 The pattern is written in US terms and contains a clear and colour-coded description of how to crochet and assemble this animal, with extra illustrations and example pictures at the bottom to help you get everything right. In the pattern you can also find what materials you need, the yarn colour numbers, in short, everything you need to know to make your own beaver amigurumi. All the additional information you need to know about this pattern you can find in the shop listings. You can buy this pattern in my shop at Craftsy and in my shop at Ravelry or order it here. 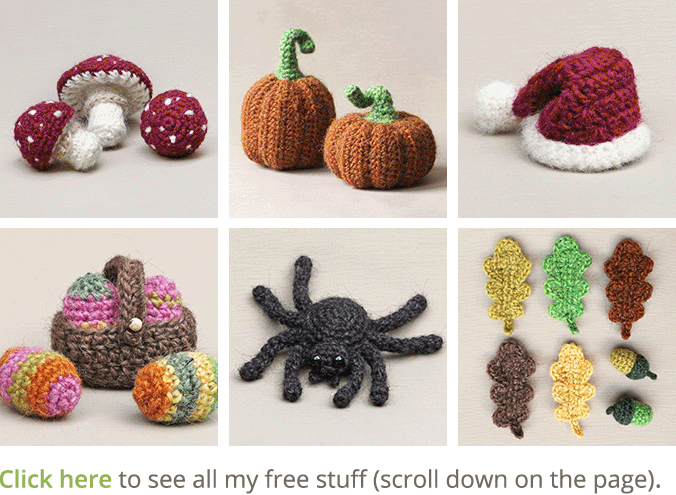 This pattern has a one dollar release discount till Friday the 9th of November so get your copy in time! After finishing my otter pattern, I jumped right into my next project. All those free days are fun but they can make one, hence me, a bit, well very lazy. 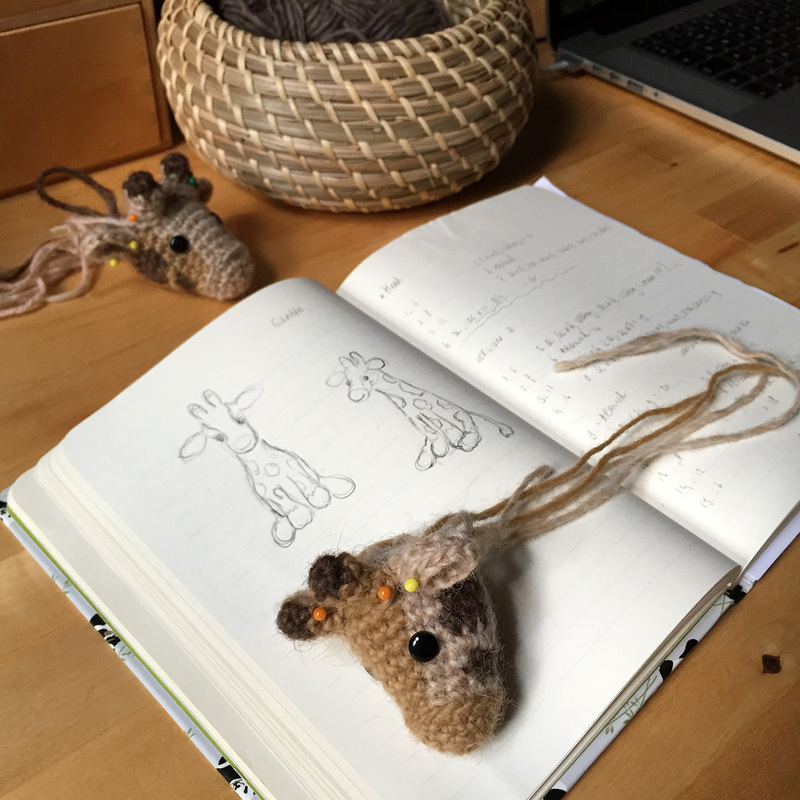 Because I knew many crafters are pining for a Son’s Popkes giraffe pattern, I started designing one right away. However, designing the giraffe’s head made me wonder about that longing for this pattern you all seem to have. Why on earth would you want a pattern with so many colour changes? Even I got completely tangeld up in all the strands and had to unravel (myself) many times. Okay I’m just joking around. It isn’t that bad. As long as you keep your three skeins of yarn untangled, the head works up just fine. The thing that was difficult for me to decide was how to divide the colours. I want my giraffe to look realistic but also basic. Two colours made him look too simple, so I chose three colours. But where to use which one? The brown was easy, that colour is for the spots. I had a hard time deciding where to use the camel and beige. When my final design for the shape of the head was finished, I made two different coloured versions to see what looked best. I made a version with a darker, camel snout with a beige/ brown spotted skin and a version with a light, beige snout with a camel/ brown spotted skin. Because it seemed most realistic and looked the best in my opinion, I decided to go for the camel snout option. I probably am not going to change my mind, but am curious what you think looks better. I am looking forward to hearing from you. Cheers! I’m so happy to announce that I have finished the updates. Last week I updated the last 14 patterns and now all my patterns are text edited for correct English and proofed a last time. The older patterns also have extra head shots of the animals so it’s easier the see where the eyes, ears, muzzles or bills go. And the patterns might even look more fancy than the most recent ones because of the decorative images of the animals on their backs. I will add those to the newest patterns too, but will do that ‘in between’ because it isn’t really necessary but just looking great. Adding those images made this experience more fun for sure, just look at them! It was a huge endeavour and in the end I really got tired of it, but it was worth it. For most patterns that got a big make over, I’ve send a Craftsy and Ravelry update message. But I forgot for some and for the rest of them I skipped the messages. I didn’t want to bother you peeps with loads of emails. Here’s a list of the patterns I have updated in case you would like to have an updated version. Send me a message and your receipt and I’ll email or send the new version to your library. There are a few patterns I made temporarily unavailable because I felt like making new and better versions of them. Basil the otter is the one I am starting with, Monty the marmot, the lop rabbit and Sjuffel the dog will follow, but I am not sure when because I also want to make a completely new pattern, a giraffe that is, after the new Basil. When I look at my work now, I am so proud. Thanks for all of your support, you crafters are fabulous! Now we are updated. Hope to be here soon with a glimpse of a new otter. Last post this year featuring your work! What better way to end this blogging year by, than with your fabulous work. Just look at all these gorgeous, funny, mischievous and whimsical looking creatures and how they all seem to have their own personalities. This was a good year full of Popkejoy! Have a wonderful new year dear crafters, may the crafty force be with us all in 2018!